David Stephenson: Internet of Things Speaker! OK, I’ll admit it, I’m a cheap Scot (living in waste-not, want-not New England, to boot! ), so I hate to waste anything. That’s why I was so excited to read about this Columbia U research project on harvesting human energy (MIT, among other institutions, has also been researching this subject for years), especially as a way to power wearable devices. This could really be a win-win for my pet project, using wearables and the Quantified Self approach to help seniors become empowered partners in their health care: get them moving, providing power for the devices reporting on their health indicators! Sweet! The EnHANTs (Energy Harvesting Active Networked Tags) study, the first extensive one of human-generated energy, attached flexible tags – so called EnHANTs – across a range of everyday objects and participants, allowed the researchers to actually document how much energy various human activities produce. 40 people participated over 9 days, including activities such as walking, running and cycling. “EnHANTs are small, flexible, and energetically self-reliant devices that can be attached to objects that are traditionally not networked (e.g., books, furniture, walls, doors, toys, keys, clothing, and produce), thereby providing the infrastructure for various novel tracking applications. Examples of these applications include locating misplaced items, continuous monitoring of objects (items in a store, boxes in transit), and determining locations of disaster survivors. Recent advances in ultra-low-power wireless communications, ultra-wideband (UWB) circuit design, and organic electronic harvesting techniques will enable the realization of EnHANTs in the near future. In order for EnHANTs to rely on harvested energy, they have to spend significantly less energy than Bluetooth, Zigbee, and IEEE 802.15.4a devices. Moreover, the harvesting components and the ultra-low-power physical layer have special characteristics whose implications on the higher layers have yet to be studied (e.g., when using ultra-low-power circuits, the energy required to receive a bit is significantly higher than the energy required to transmit a bit). Coupled with some of the research I’ve cited earlier about batteries the size of a grain of sand or harvesting energy from “ambient backscatter” makes me confident that, in the near future we’ll be able to have effective wearable devices for reporting health conditions that will require little or no external energy sources. 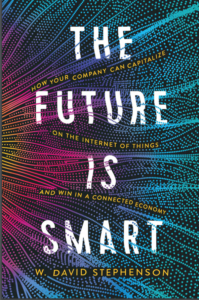 Buy my IoT strategy book! No more excuses for companies to delay IoT strategies!